Be effective in the business world today, to put all chances on his side. The accounting firm KGT Consultant is able to offer a high quality and trustworthy service. Whether you are starting up or growing, we have the expertise that is necessary to ensure the success of your business. Services offer by Jean Jacques Alary Plus Inc. specialize formation in transportation. Advice in trucking, with the act respecting owners, operators and drivers of heavy vehicles , PEVL-DOT file and CTQ, policies and procedures compliance Canadian and American, C-TPAT evaluation and policy, Federal Motor Carrier Regulation, PEP program, Urgency and security plan. A software on the Fuel tax management develop in collaboration with Compact Service, In sale by us! To order Order Form. webSite for trucker realize by Benoit Therrien. You will find intersting information on this website. 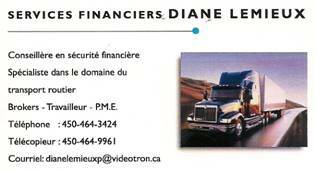 Insurance for truck loan & insurance-salary!